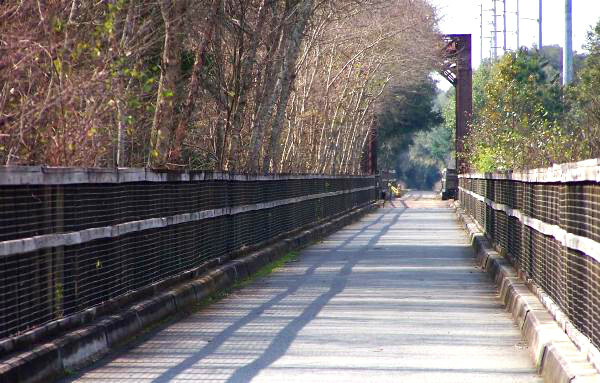 The Nature Coast State Trail is a 32 mile long paved multi-use trail that extends from Chiefland, in Levy County Florida, to Cross City in Dixie County. It occupies the right of way that was once the route for the historic Atlantic Coastline Railroad. The trail connects the towns of Cross City, Trenton, Fanning Springs and Chiefland, with its center point at Wilcox Junction, near Old Town, Florida. Eventually, the trail is planned to extend another nine miles east from Trenton toward Newberry. The paved trail is suitable for hiking, bicycling and roller blading. An 4.5 mile unpaved trail suitable for horseback riding parallels the paved trail from Old Town to Fanning Springs. There are five official trailheads, at Chiefland, Trenton, Fanning Springs, Old Town and Cross City. Parking is available at all trailheads, including horse trailer parking at Old Town. Picnic tables are located at Chiefland and Cross City, and restrooms are Chiefland, Trenton, Cross City and at Fanning Springs State Park. Much of the trail running parallel to US highway 19 and state road 26 has little shade. However, there are sections that go through densely forested areas. The Nature Coast State Trail is a good way to see the "old Florida" from your bicycle. One of the most popular parts of the trail is the trestle crossing over the Suwannee River at Old Town. Since the Nature Coast State Trail links the downtown areas of several Florida communities, restaurants and hotels are nearby. Bringing your bike on a trip to this part of the Nature Coast provides a good way to see these picturesque towns, and visit nearby Fanning Springs and Manatee Springs State Parks - while staying in one location and using the trail as your connector.